Pedrollo TOP-GM Submersible Pump for Clear Water TOP 1 GM 0,25 kW 0,33Hp Monophase Cable 5 Mt MAGNETIC FLOAT SWITCH Body Technopolymer Impeller NORYL. With vertical magnetic float switch. Shaft with double seal and oil chamber. The TOP-GM series is suitable for use with clear water that does not contain abrasive particles and comes complete with a vertical float switch meaning that the pumps can be used in particularly small spaces. As a result of the design solutions that have been adopted, such as the complete cooling of the motor and the shaft with double seal, these pumps are easy to use and reliable. They are suitable for use in applications such as draining small flooded areas (rooms, cellars, garages) in the event of an emergency, for the disposal of waste water in the home (from dishwashers, washing machines) and for emptying drainage traps. Liquid type: clean water Uses: domestic. Typology: submersible Family: submersible pumps. Temperature of the liquid to +40 °C 3 m maximum immersion depth (with a sufficiently long power cable) Passage of suspended solids up to Ø 10 mm Suction down to 14 mm above ground level Continuous service S1. TOMEIWATERSOLUTIONS: Since 2007 the TWS, has been an operating company specialized in pumps for domestic and industrial use, of all the different kinds: centrifugal, peripheral, submersible, self-priming, multistage. The TWS is an authorized reseller of national and international brands, such as: Dab, Lowara, Ebara, Grundfos and Calpeda. All its items are with full and rigorous compliance with the Italian and European laws and regulations in force. The TWS, leading its clients to find the best solution, is nowadays considered one of the first preferred supplier: quality, efficiency and experience are essential values of the TOMEIWATERSOLUTIONS. You have to provide us with your telephone number so to inform the courier. Items must be unused, in a reasonable condition and in the original packing. Get all the Latest News, Updates and Offers. 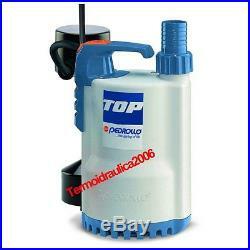 The item "Submersible DRAINAGE Electric Pump clear water TOP1GM 5M 0,33Hp 240V Pedrollo" is in sale since Friday, May 30, 2014. This item is in the category "Garden & Patio\Ponds & Water Features\Pond & Fountain Pumps".